Several empirical studies have explored the respondents’ attitudes and perceptions on corporate social responsibilities. Very often, the measurement of corporate citizenship could have involved quantitative analyses on organisational commitment toward responsible organisational behaviours (Maignan, Ferrell and Hult, 1999; Aupperle, Carroll and Hatfield, 1985). Therefore, their survey responses could not have revealed and explained actual corporate citizenship practices. Other research could have focused on investigations of managerial perceptions of corporate citizenship rather than focusing on corporate behaviours (e.g., Basu and Palazzo, 2008; Singhapakdi, Kraft, Vitell and Rallapalli, 1995). A number of similar studies have gauged corporate citizenship by adopting Fortune’s reputation index (Fryxell and Wang, 1994; Griffin and Mahon, 1997; Stanwick and Stanwick, 1998), the KLD index (Fombrun, 1998; Griffin and Mahon, 1997) or Van Riel and Fombrun’s (2007) Reptrak. Such measures require executives to assess the extent to which their company behaves responsibly toward the environment and the community (Fryxell and Wang, 1994). Despite their wide usage in past research, the appropriateness of these indices remains doubtful. For instance, Fortune’s reputation index failed to account for the multi-dimensionality of the corporate citizenship construct and is suspected to be more significant of management quality than of corporate citizenship (Waddock and Graves, 1997). Fortune’s past index suffered from the fact that its items were not based on theoretical arguments as they did not appropriately represent the economic, legal, ethical, and discretionary dimensions of the corporate citizenship construct. Hunt, Wood and Chonko’s (1989) investigated broad based perceptions on (a) the extent to which employees perceive that managers are acting ethically in their organisations (b) the extent to which employees perceive that their managers are concerned about the issues of ethics in their organisations and (c) the extent to which employees perceive that ethical (or unethical) behaviour is rewarded (or punished) in their organisation. Other authors, including Webb, Mohr and Harris (2008) also explored the philanthropic values that were related socially responsible consumption. Pinkston and Carroll (1994) identified four dimensions of corporate citizenship, including; orientations, stakeholders, issues, and decision-making autonomy. They argued that by observing orientations, one may better understand the inclinations or posturing behaviours of organisations with respect to corporate citizenship. The stakeholder dimension should better define to whom the organisation feels responsible as it could identify where the corporate citizenship issues or social concerns are originating. The aspect of decision-making autonomy was believed to illuminate the perceived importance of corporate citizenship as one that determines at what organisational level corporate citizenship decisions are actually made. In a similar vein, Griffin and Mahon (1997) combined four estimates of corporate citizenship: the Fortune reputation index, the KLD index, the Toxic Release Inventory (TRI), and the rankings provided in the Directory of Corporate Philanthropy. They admitted that their four measures do not necessarily track one another. Such findings suggest that these indicators may not be representative of the same underlying construct and their items may not be sufficient to provide an overall understanding of corporate citizenship. Singh, De los Salmones Sanchez and Rodriguez del Bosque (2007) adopted a multi- dimensional perspective on three domains, including; commercial responsibility, ethical responsibility and social responsibility. Firstly, they proposed that commercial responsibility of businesses relates to their continuous development of high quality products and truthful marketing communications of their products’ attributes and features among customers. Secondly, they maintained that ethical responsibility is concerned with businesses fulfilling their obligations toward their shareholders, suppliers, distributors and other agents with whom they make their dealings. Singh et al. (2007) argued that ethical responsibility involves the respect for the human rights and norms that are defined in the law when carrying out business activities. They hinted that respecting ethical principles in business relationships has more priority over achieving superior economic performance. Their other domain, the social responsibility is concerned about laudable behaviours. The authors suggest that businesses could allocate part of their budget to the natural environment, philanthropy, or toward social works that favoured the most vulnerable in society. This perspective supports the development of financing social and/or cultural activities and is also concerned with improving societal well-being. Basu, K., & Palazzo, G. (2008). Corporate social responsibility: A process model of sensemaking. Academy of Management Review, 33(1), 122-136. Fombrun, C. J. (1998). Indices of corporate reputation: An analysis of media rankings and social monitors’ ratings. Corporate reputation review, 1(4), 327-340. Fryxell, G. E., & Wang, J. (1994). The fortune corporate ‘reputation’ index: Reputation for what?. Journal of management, 20(1), 1-14. Griffin, J. J., & Mahon, J. F. (1997). The corporate social performance and corporate financial performance debate twenty-five years of incomparable research. Business & Society, 36(1), 5-31. Hunt, S. D., Wood, V. R., & Chonko, L. B. (1989). Corporate ethical values and organizational commitment in marketing. The Journal of Marketing, 79-90. Maignan, I., Ferrell, O. C., & Hult, G. T. M. (1999). 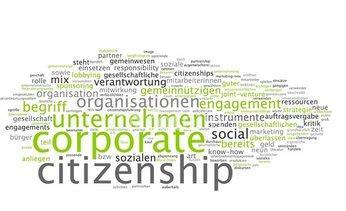 Corporate citizenship: cultural antecedents and business benefits. Journal of the Academy of Marketing Science, 27(4), 455-469. Pinkston, T. S., & Carroll, A. B. (1994). Corporate citizenship perspectives and foreign direct investment in the US. Journal of Business Ethics, 13(3), 157-169. Singh, J., & Del Bosque, I. R. (2008). Understanding corporate social responsibility and product perceptions in consumer markets: A cross-cultural evaluation. Journal of Business Ethics, 80(3), 597-611. Singhapakdi, A., Kraft, K. L., Vitell, S. J., & Rallapalli, K. C. (1995). The perceived importance of ethics and social responsibility on organizational effectiveness: A survey of marketers. Journal of the Academy of Marketing Science, 23(1), 49-56. Stanwick, P. A., & Stanwick, S. D. (1998). The relationship between corporate social performance, and organizational size, financial performance, and environmental performance: An empirical examination. Journal of Business Ethics, 17(2), 195-204. Van Riel, C. B., & Fombrun, C. J. (2007). Essentials of corporate communication: Implementing practices for effective reputation management. Routledge. Waddock, S. A., & Graves, S. B. (1997). The corporate social performance-financial performance link. Strategic management journal, 18(4), 303-319. Webb, D. J., Mohr, L. A., & Harris, K. E. (2008). A re-examination of socially responsible consumption and its measurement. Journal of Business Research, 61(2), 91-98.